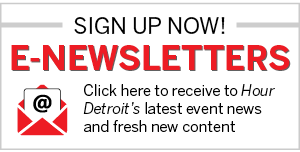 Detroit is known for many things — manufacturing, Motown Records, and architecture to name a few. But the geography isn’t much to write home about. The monotonous, flat landscape offers little in the way of views. Thank goodness, then, for the Detroit River. The 1- to 2-mile-wide strait connecting Lake St. Clair and Lake Erie and separating the U.S. and Canada is by far the city’s most prominent natural feature. The Jeffersonian Towers over the Berry subdivision. For millennia before the first European settlers arrived in Detroit, the strait was both sacred and of immense practical value to native people, who used the waterway to travel and conduct trade. In 1701, when Antoine Laumet de La Mothe, Sieur de Cadillac, landed on the banks of what would come to be known as Detroit, the colonizer quickly grasped the value of riverfront real estate. Following French custom, Cadillac divided claims into “ribbon farms”â€„—â€„each about 250 feet wide and 3 miles long —â€„that all featured river frontage, ensuring all landowners in Detroit equitable access to the waterway for which the city is named. The east riverfront is a natural starting point, as it features some of the most desirable real estate in the city and a variety of housing options — high-rise apartments and condos, waterfront manses, and canal-fronting home — all with stunning views of the city’s greatest asset, the Detroit River. 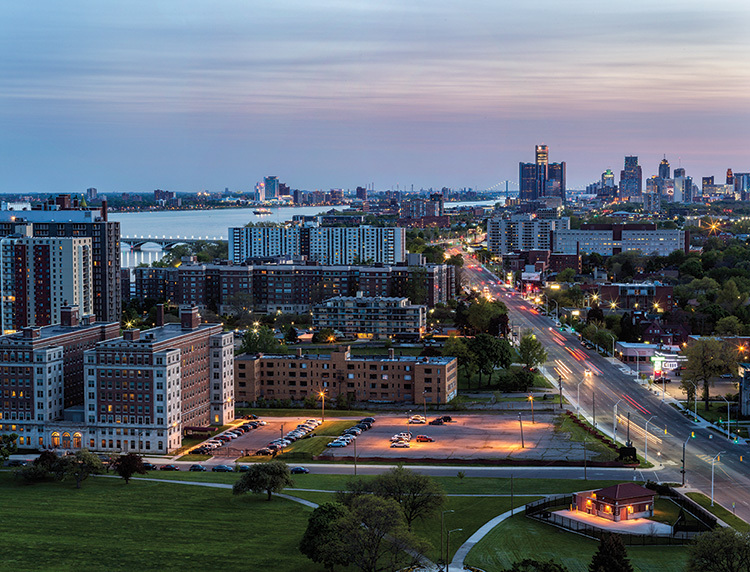 The Jeffersonian apartments and the homes of the Joseph Berry Subdivision, which are located near each other, are great examples of the diversity of options for riverfront living in Detroit. Alexander Brooks has lived in The Jeffersonian for nearly 30 years. His balcony overlooks Erma Henderson Marina and the downtown skyline. The Roaring ’20s, when the rise of Art Deco skyscrapers paralleled the rise of the automotive industry, may have been Detroit’s architectural heyday. But the midcentury period was another high point, leaving behind stellar works like One Woodward Avenue and the McGregor Memorial Conference Center, designed by Minoru Yamasaki, who is best known for the World Trade Center and is one of Detroit’s most famous architects (second only, perhaps, to Albert Kahn). And of course there are the towers, townhomes, shopping center, and school of Lafayette Park, all designed by German-born modern master Ludwig Mies van der Rohe. But less celebrated is The Jeffersonian, a 30-story, 410-unit midcentury masterpiece towering over the western edge of the Joseph Berry Subdivision along Detroit’s east riverfront. Designed by Detroit firm Giffels & Rossetti (the original architects of Cobo Hall) and built in 1965, The Jeffersonian was constructed so lavishly that it bankrupted its developer, Arthur Fleischman. Still, he succeeded in his goal of building what was then the premier riverfront high-rise in the city. 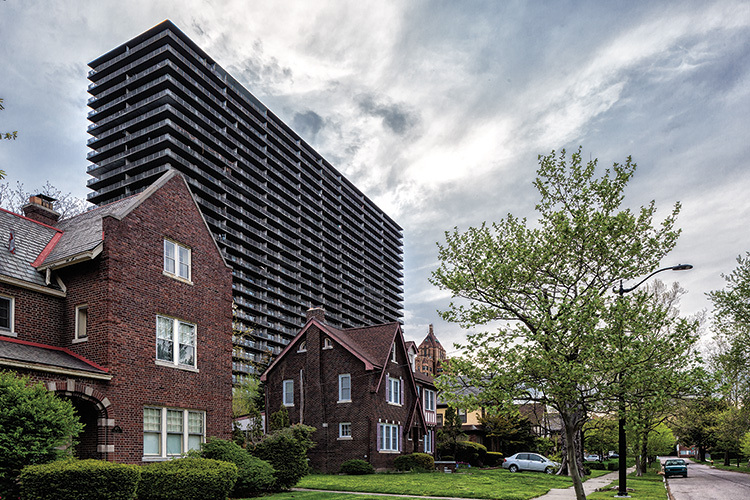 The towering block of a building features views of cityscapes that are uniquely Detroit — the downtown skyline, blocks of the near east side that are lush with greenery and sparse of houses, Chrysler’s sprawling Jefferson North assembly plant, Waterworks Park, and the tidy Berry sub immediately below. And then there’s the water. The Jeffersonian features floor-to-ceiling windows with stunning views. Jeffersonian apartments look out on the Detroit River and Lake St. Clair, Belle Isle, a pair of marinas, and Windsor, Ontario. No unit in The Jeffersonian is deprived of a stunning view, each featuring floor-to-ceiling windows and an individual balcony (corner units have two). “Everyone has a backyard in the sky, I like to say,” says Beverly Silk, whose family business, Saperstein Associates Enterprise, has owned and managed The Jeffersonian for 50 years. She’s referring to the fact that residents all tend to customize their balconies with everything from hanging plants and beach loungers to putting greens and workout equipment. And stay they do. According to Mary Harrington, property manager of The Jeffersonian, who herself has lived in the building for over 15 years, the average Jeffersonian resident’s tenure is about a decade. “We have some residents who have been here over 40 years,” she says. Alexander Brooks, 57, is one of the longer-tenured residents of The Jeffersonian, having called the building home for nearly 30 years. 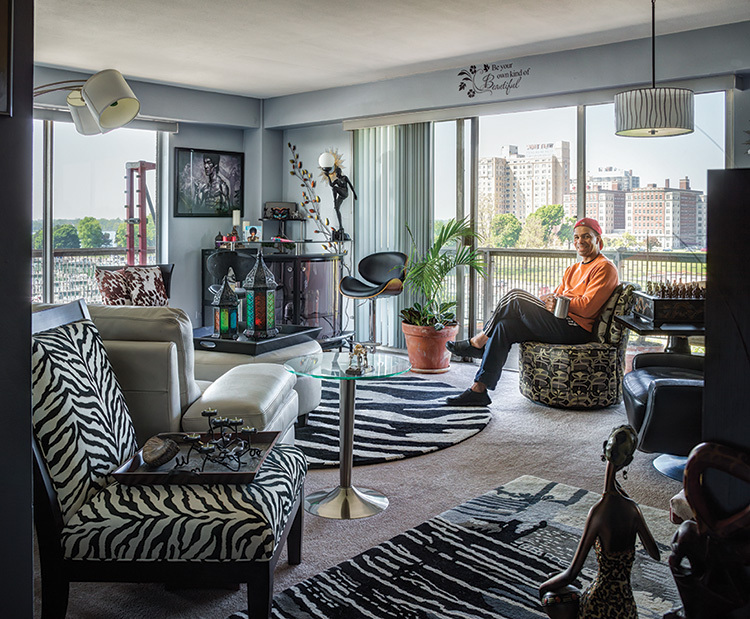 He immediately began customizing his current fifth-floor unit in August 2014 when he moved in from a different unit he shared with his brother for several decades. The Berry Subdivision boasts large Colonials and Tudors from the 1910s and ’20s, plus a few modern McMansions that were built in the 1990s. “I was shown one of the other units and I was kind of inspired to put this one together,” he says. Brooks’ apartment features Asian-inspired décor, zebra-striped accents, and a variety of custom furniture pieces. His balcony, which has views of Erma Henderson Marina and the downtown skyline, features workout equipment. “It’s contemporary and a little funky — a carefree type of style. It fits my personality,” Brooks says. The layouts of The Jeffersonian’s apartments lend themselves to customization. There are four floor plans, from one- to four-bedrooms, each featuring a bathroom per bedroom and multiple walk-in closets. Corner units feature wrap-around balconies. In addition to the units themselves, the building’s amenities, which include a heated Olympic-size swimming pool, tennis court, neighboring Erma Henderson Park and Marina, and a 24-hour doorman, keep residents happy. But the best thing about The Jeffersonian might be the relative affordability of its units. Depending on floor plan and view, rents range from $710 to about $2,000 per month, quite a bargain when you look at what some non-waterfront apartments are going for in downtown and Midtown. Leases are made over one-year terms, and occupancy tends to be at or near 92 percent. 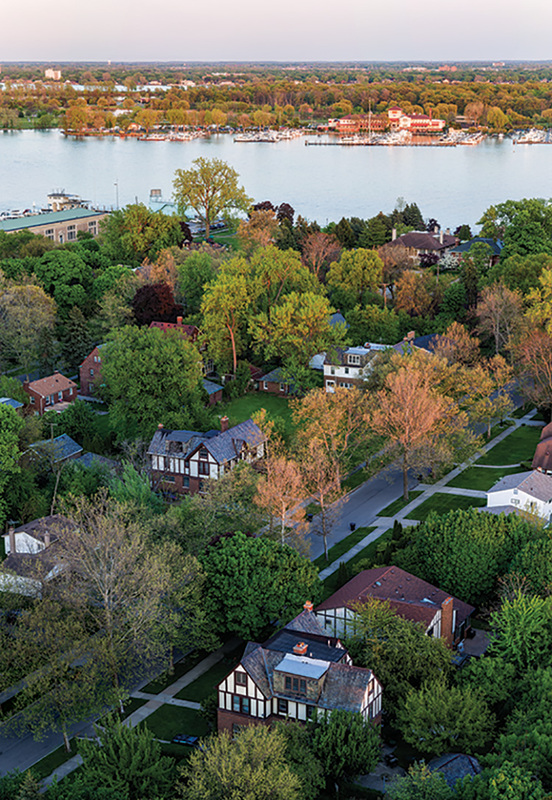 Just east of The Jeffersonian and tucked below Jefferson Avenue and extending to the Detroit River, the Joseph Berry Subdivision is a small neighborhood consisting of just four streets and fewer than 90 homes, but the beauty of its residences — and the influence of its residents — are outsized. Large Colonials and Tudors from the 1910s and ’20s (and even a handful of McMansions from the 1990s) line the neighborhood’s streets. Every Detroit mayor since Jerome Cavanagh (with the exception of Ken Cockrel Jr., who served just shy of eight months in office after embattled former Mayor Kwame Kilpatrick resigned) has called the Manoogian Mansion, located at 9240 Dwight St., home during their tenures as mayor. The 1928 Spanish Colonial has served as the official residence of the mayor of Detroit since it was donated to the city in 1966. Diane Linn has lived with her husband, Thom, in their home on Dwight Street since 1983. The house — a 10-room, 5,200-square-foot Georgian Colonial — was built in 1920 by the Webbers, a prominent Detroit family who ran a lumber company and established something of a family colony along Dwight Street, building five houses for members of their immediate and extended family. “All of the families would gather at our house for Sunday dinner,” says Diane. The houses were also connected literally, all heated by an external furnace that delivered steam via underground pipes, though that system has since been modernized. Since the Webbers moved out, the house had seen a slew of owners. A prominent local insurance agent who was friends with Muhammad Ali owned the house before the Linns, who have a photo of The Greatest playing pool in one of the rooms upstairs. Later, an off-campus Wayne State University fraternity owned the house and did quite a bit of damage to the moldings in what likely must have been some epic keggers. “We did a tremendous amount of woodwork restoration,” says Diane. “We stripped it all down to bare oak. The kitchen’s been totally redone. Right now we’re having column restoration done. The Linns’ Georgian Colonial, which is a common architectural style in the South, was designed with natural cooling features, including front and rear doors on both levels to allow for the circulation of air coming off the river. 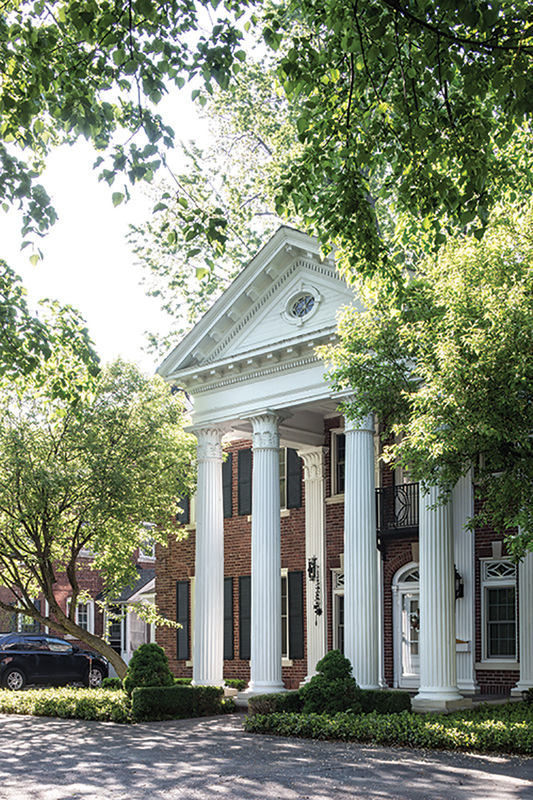 Diane Linn and her husband, Thom, have lived in their Georgian Colonial since 1983. 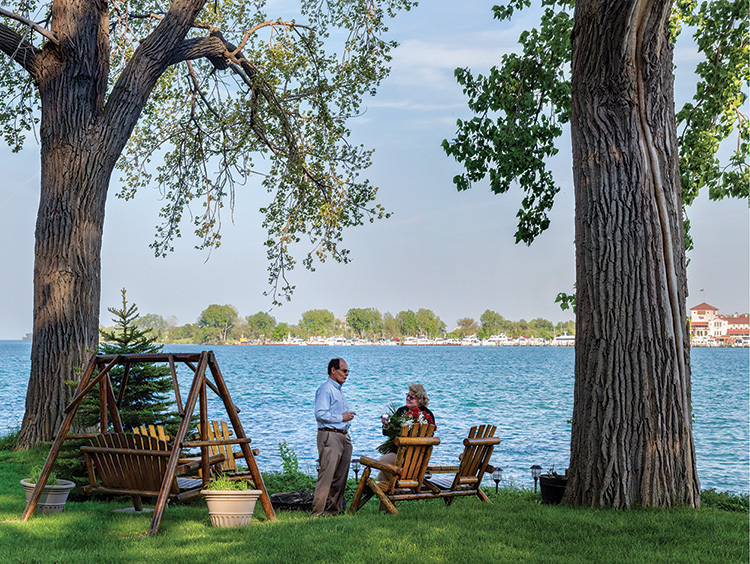 The backyard offers a view of the Detroit River and Belle Isle. Of course, if it gets too hot in the summer months, just being in the beautiful backyard of the house is a great way to cool down. The 300-foot-deep yard stretches from the back porch of the house directly to the riverfront, is dotted with shady maples and willows and features a view of the eastern half of Belle Isle. “We see a lot of the Diamond Jack tour boats, and we hear them talking on the loudspeaker talking about the history of the houses and the mayor’s mansion,” says Diane. “We also see a lot of dinner cruises from Lake St. Clair and pleasure boats. During Prohibition, it’s possible that the house’s riverfront location had other advantages beyond beautiful views and temperate breezes. Today, homes like the Linns’ are still good for a party. Neighbors wander around between backyards, which have no fences, during annual events such as hydroplane races and fireworks (the venerable boat race — now dubbed the UAW-GM Spirit of Detroit HydroFest celebrates its 100th anniversary in August). Two of the four Linn children have been married in the backyard, and for years the Linns have hosted an annual ticketed soiree during the hydroplane races, with the proceeds going to a charity of their choosing. The Community Chorus of Detroit, of which Diane is the executive director and president of the board, has often been the beneficiary. 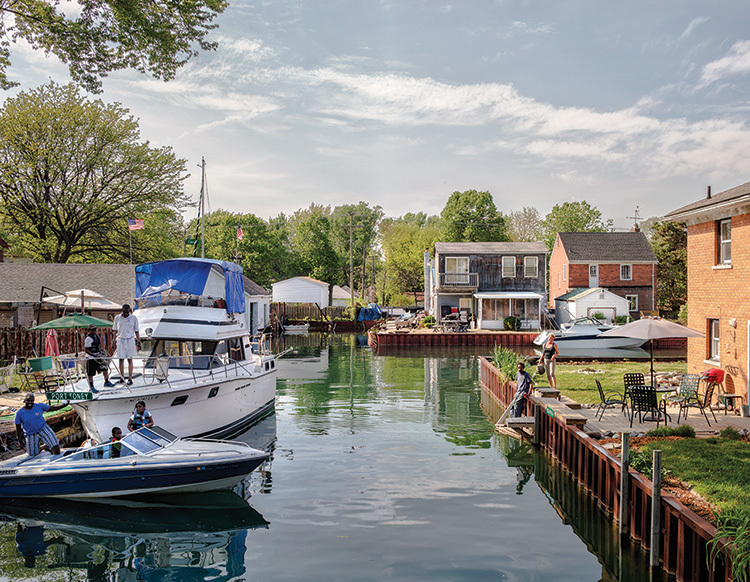 Surprisingly affordable homes in the Harbor and Klenk Islands in the Jefferson-Chalmers neighborhood are situated on canals that offer access to Lake St. Clair and the Detroit River. The parties haven’t been limited to the yard, either. One Christmas, a 16-voice choir with orchestra did a performance of Handel’s Messiah in period costume — right in the Linns’ living room, which is adjacent to the house’s main hall where the Linns often install a 20-foot Christmas tree that has to be decorated on ladders. “When we moved in back in the ’80s, we chose the neighborhood not only for the architectural beauty, but because it was a racially diverse neighborhood,” says Diane. “Being a part of the life of the city was really an important consideration. Over the years, our neighborhood has remained diverse. It’s the kind of place where people take casseroles to each other, walk their dogs, ride their bikes. The price is right at Alden Towers, a 380-unit apartment complex on East Jefferson Avenue at the foot of Van Dyke Avenue. Units range from 300-square-foot studios to 1,300-square-foot three bedrooms. While some of the historical charm of individual apartments’ interiors has been replaced with modern drywall and many other practical features — including brand-new appliances — you get a lot of bang for your buck at Alden. Additionally, you are right up the road from Belle Isle, Gabriel Richard Park, and the east RiverWalk, as well as walking distance from the burgeoning retail and restaurant scene of West Village. Orleans Landing is under construction east of downtown. It has immediate access to the Dequindre Cut. Jefferson-Chalmers The varied homes on Harbor and Klenk Islands in the Jefferson-Chalmers neighborhood just west of Grosse Pointe Park are some of the city’s best-kept secrets. Situated on canals that allow homeowners immediate access to Lake St. Clair and the Detroit River, it’s amazing that prices are relatively affordable at $100,000-$200,000 per house. Amenities in Grosse Pointe Park and a burgeoning retail scene on East Jefferson, which features Hello Records and Coffee & (___), are just a short bike ride or walk away. An entirely new neighborhood is being constructed in the warehouse district east of downtown. 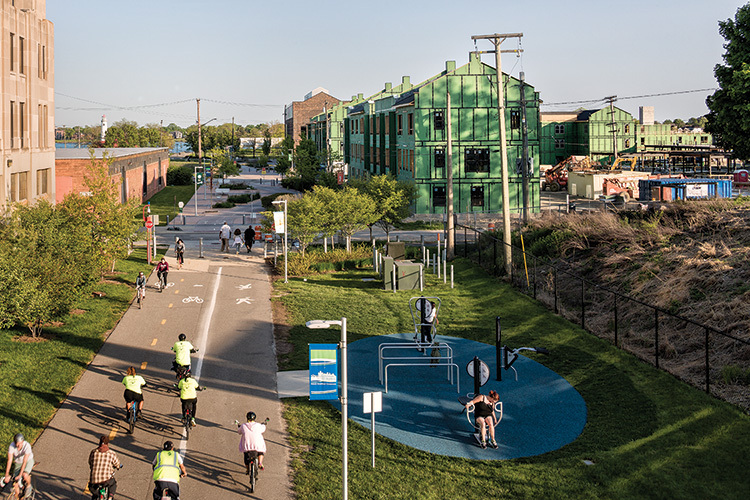 With river views access to the RiverWalk and Dequindre Cut, and proximity to downtown and Eastern Market, apartments in this $65 million, 270-unit development are expected to fetch rents between $1,500 and $2,000 per month. And stay tuned for even more. The city recently tapped a team to develop a comprehensive plan for the East Riverfront District. Think of Detroit’s historic Berry Subdivision as it’s own little three-street-long, one-block-wide oasis. The Manoogian Mansion rests along the river here, and is often the star of the show. And there’s the Linn home on Dwight Street featured in our main story. But there are plenty of other noteworthy structures. Take the Stanton house for example. After all, it was there first. The then-named “Park View” development began before the turn of the century. In 1898, architect Louis Kamper built a structure for Detroit clothing manufacturer Marvin Stanton. 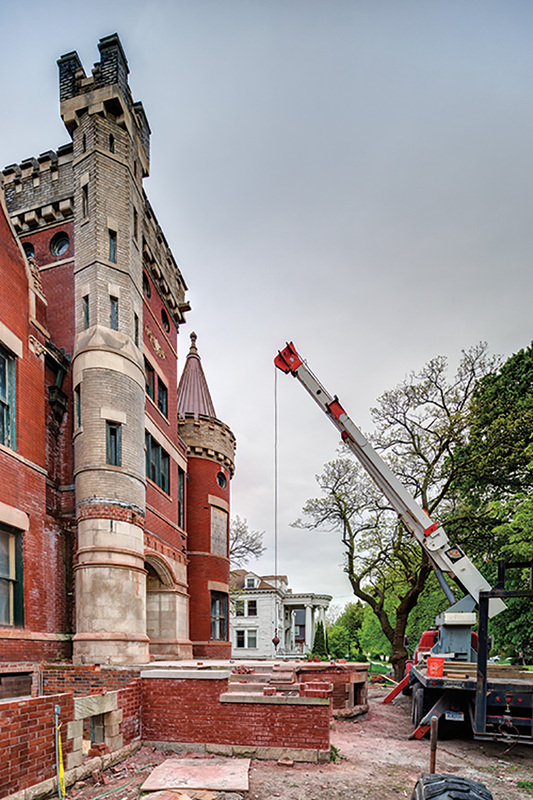 The home — with its towers and turrets — gained the nickname, “The Castle.” The Manoogian is a spring chicken in comparison. Built in 1928, it became the mayor’s place when the Manoogians (founders of Masco) donated it to the city in 1966. But that’s another story. “The Castle” used to be run as a banquet hall by Sean Shannon. From 1987 on, he hosted intimate fundraisers, weddings, and more. Shannon moved to Southfield and started Tapestry. The Linn home on Dwight Street. The Castle and The White House sit side by side on Parkview, with their backyards snugging up to the Stanton Canal. The White House, too, has a storied past. Built in 1905, it was run as a bed and breakfast by Shannon’s late mother, Mary Jean Shannon, accompanied by her faithful dog, Ernie, in the early to mid-’90s. a deal was pending. But fair warning. A crew member renovating The Castle next door estimated that the outside alone would take around $100,000 to spruce up. In fact, another former owner, Michele Bezue (who owns the Detroit Marshmallow Company) says that before she sold the house during the 2007 recession (“Too much work for not enough money,”), she got an estimate of $28,000 for historically accurate, energy-efficient windows in the front of the house alone. Things get a bit murky here. Apparently it was later owned by a mysterious “pastor” who up and abandoned it. Whoever ends up in The White House will get a six-bedroom, three full- and two-half bath place. There are porches off four of the rooms with views of the canal. Oh, and that house next door is certainly nice, too. As is that little Manoogian place down the road.